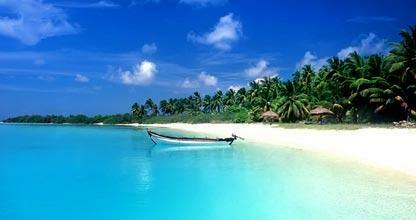 I am going to Phuket, but in which area should I stay and which beach will best represent the holiday I have in mind? This is a frequent question we get from clients and one which is important to answer correctly. Some require somewhere with safe swimming conditions for kids, many want to be near entertainment and nightlife and some want a quiet and romantic location. Below we offer information aimed to help decide where are the best places to stay in Phuket for your particular needs to be met. The island's coastline ranges from rocky outcrops to 11 km long uninterrupted quiet beaches to the up-beat vibe of Karon and raunchy nightlife of Patong. Referring to our map of Phuket, Patong, Karon, Surin, Kamala and Kata Beach are in the middle of the west coast, feature higher concentration of hotels and are near entertainment. North from here Bangtao Bay is a quieter area while Nai Yang and Mai Khao are secluded. On the east coast facing fascinating Phan Nga Bay is restful Rawai, Freedom and Panwa Beach gracing the Panwa Peninsula 30 minutes from Patong. Now, lets discuss each of the most popular areas separately. 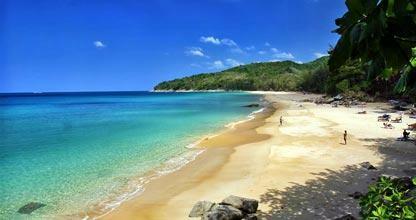 Bangtao Bay offers 6 km of squeaky sand 30 minutes north of Patong and 20 minutes from the airport . 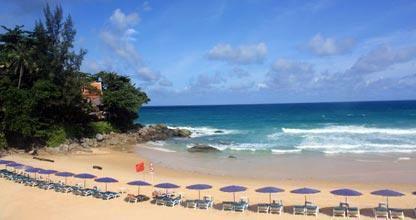 Though it features a few seaside pubs and restaurants it is a much quieter location than Karon or even Kata. It is close to the village of Cherng Talay where villagers to this day make a living by fishing and rubber harvesting. Resorts in Bangtao offers good choice in terms of luxury oceanfront accommodation with the Laguna resort complex located here. The complex is surrounded by placid lagoons and flaunt top 5 star hotels like like the Dusit Thani Laguna, Outrigger Phuket Resort and Angsana Laguna which are recommended hotels to stay with kids given their extensive family friendly facilities. Also featuring in the complex is the luxurious Banyan Tree private pool villa resort. All these have access to a world class golf course. 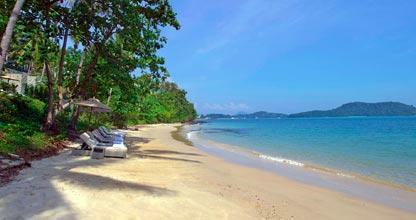 The southern end of Bangtao features the 4 star Sunwing Resort with great facilities for small children and babies. On the east coast of the island approximately 40 minutes from Patong the Cape Panwa Peninsula stretches its arm south-eastward between Phuket Town and Chalong Bay. If your idea of a tropical island getaway is one of extraordinary views across a fascinating and pristine bay with pure white sand audible under your feet, swaying palms, a romantic atmosphere and glimpses of authentic island lifestyle, we suggest heading for Panwa. Through all the development on the island this location best retains its natural exotic charms. It is a great area for families where children can play safely in the placid water of the bay and another big attraction here is the multi million Baht aquarium which include a walk-through water tunnel featuring all the creatures of the sea. Though you will not found structure upon structure along the beach invading the exotic scenery Panwa Beach still feature a nice variety of hotels from cheap budget accommodation to 5 star luxury. This is one of the most beautiful and best beaches in Phuket for an intimate stay and lies 15 minutes north of Patong, but without the noise. Kamala is often hailed for being clean and relaxed with a quaint village. It is also home to the Phuket FantaSea, one of the biggest tourist attractions on the island and the curving bay offer safe swimming most of the year. Though it does not see tourist hordes, those who come here do not stay anywhere else on their next visit. The best resorts in Kamala Beach include the adults only Cape Sienna recommended for a honeymoon break, 4 star hotels for families like The Sunwing Resort and 5 star luxury hotels like Andara, The Bell Pool Villa Resort and U Zenmaya. Moments south of the buzz in Karon and 15 minutes from the pulsating vibe in Patong the white sands and clear water of Kata Beach reveal itself. It has all the conveniences nearby like restaurants and shopping, but not to the extend you will find in Patong and Karon, therefore maintaining a balance between commercial activity and relaxed island vibe. Beachfront hotels in Kata like the Katathani, Boathouse Resort, The Shore at Katathani and Mom Tri's Villa Royale means no road separates you from the silky sands. Kata Noi (Noi being the Thai word for small) is a small cove separated from Kata proper. It offers more personal space and privacy and subsequently one of the best locations for couples on a romantic honeymoon break. 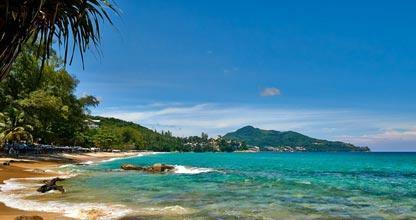 Karon is located 5 minutes south of the glittering lights and buzz of Patong. It is not quite as explosive as Patong and its nightlife less raunchy, but it certainly do offer a vibrant village with no shortage of restaurants, markets, nightlife venues and a nice 3 km long stretch of fine white sand. Though Patong is the busiest, depending who you talk to it is debatable whether Patong is regarded as more popular than Karon. Accommodation ranges from top notch 5 star luxury to more budget friendly and everything in-between. 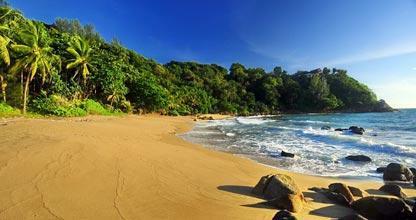 Karon is a good all-rounder and cater to all accommodation preferences for families to couples. Centara Grand Beach resort featuring a seaside water park and Movenpick Resort and Spa offering 2 bedroom family suites with equipped kitchens are great destinations for families while Beyond Resort is adults only. Patong is 3 km long and in the centre of the west coast. 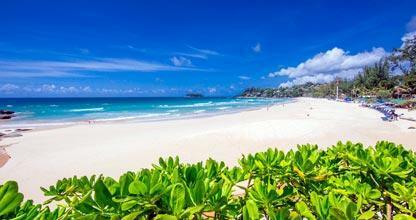 While it is the most touristy and developed area in Phuket there is good reason for its popularity. Every convenience you can imagine is here including the Jungceylon shopping mall, the famous, yet often raunchiest nightlife scene in Thailand which is centered around Bangla Road, pulsating streets lined with restaurants and bars and it offers exiting water sports. While this area is recommended if you prefer a lively cosmopolitan scene, the best places in Patong which include the trendy B-Lay Tong featuring a yuppy beach club, the beachfront pool villas of La Flora, Kalima, The Sense Resort and several other 5 star luxury hotels are set in total tranquility, yet within arm's length of the action. If the kids are coming check out our Patong hotel deals at Holiday Inn and Graceland Resort. 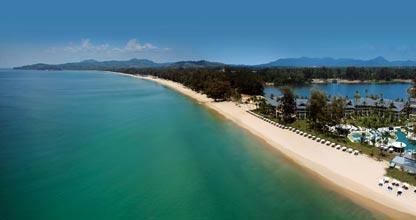 Surin is home to mainly deluxe 5 star accommodation at places like The Surin Resort and TwinPalms. Though a popular location Surin is rather exclusive and therefore not overly busy featuring a quaint town reminiscent of a little coastal village. 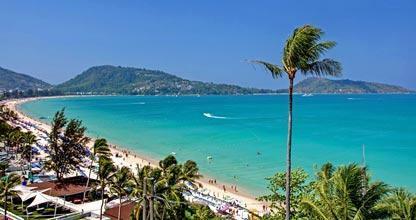 The area's exclusivity combined with its close proximity to Patong only adds to its popularity. The sand here is a fine white powder and the mainly high-end hotels has given rise to some top notch restaurants and wine bars. Should you wish to stay on Surin a little less expensive, check out the popular Manathai while DoubleTree Hilton has great accommodation for families, a pool with a jumbo slide and kids club. 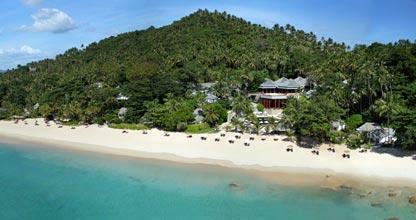 Mai Khao is located at the secluded northern tip of the island. As the longest on the island it offers 11 kilometers of sand which sees a mentionable absence of commercial development. If you want to see as little other tourists as possible, enjoy more privacy than elsewhere and romantic ocean sunsets head for Mai Khao. The down side? The sand is course; you will notice some air traffic and swimming can be hazardous May to October. Nevertheless you will find accommodation and facilities at hotels in Mai Khao like Anantara Resort & Spa, Sala Phuket , JW Marriott and Renaissance Resort to be top notch places for families and couples. Nai Yang, located just south of Mai Khao and partly inside Sirinath National Park, is a laid back location promising true relaxation to its visitors. Located only 5 to 10 minutes’ drive from the airport, commercial development and accommodation is limited. Perfect for quiet quality time at one of the best spa resorts on the island namely the luxurious Indigo Pearl. Located between Bangtao and Nai Yang this is the ideal spot to get away from the crowds which locals claim it to be their most beautiful ribbon of sand. During high season, November to April, it is great for swimming, relaxing at a bar or dining with your feet in the sand. During low season, May to October, it gets really quiet and the sea quite rough at times. A quiet little spot on the southern tip of the island. It has few accommodations and is great for swimming November to April. The rest of the year care should be taken with strong under currents at times. Restaurants located just above the shore are a great opportunity to enjoy a sun downer while appreciating the view. 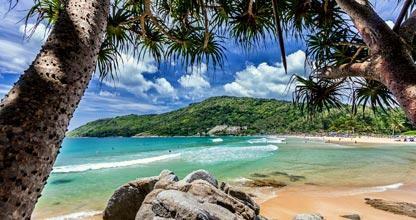 Though a secluded location you can easily reach areas such as Panwa and Kata Beach from here. 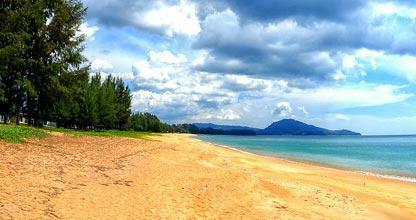 To the south-east Rawai greets you with a relaxed atmosphere. Pre-tourist explosion Rawai was the local and often international tourist hot spot. Pick-nicks where the Sunday in-thing and when one sits at one of the waterfront restaurants it is easy to understand why. This is a place where you fall asleep in the shade of Casaurina trees while enjoying views of small off-shore islands like Koh Bon, Koh Lone, Coral Island.